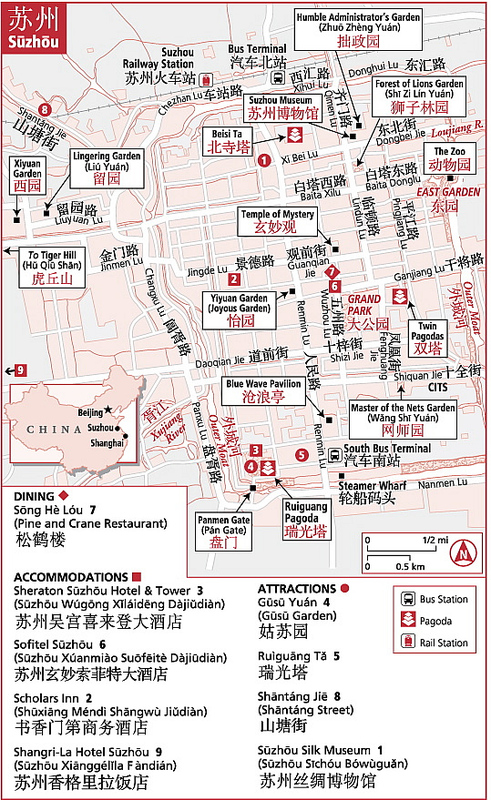 This is an itinerary designed for foreign tourists to explore the Suzhou Style Classical Garden Arts within one day. Now in Suzhou, there are 4 most famous classical gardens: The Surging Waves Pavilion - representing the garden style in Song Dynasty (960-1279 AD), Lion Forest Garden - representing the garden style in Yuan Dynasty (1206-1368 AD), Humble Administrators Garden - representing the garden style in Ming Dynasty (1368-1644 AD), Lingering Garden - representing the garden style of Qing Dynasty (1644-1911 AD). The ancient gardens in Suzhou mainly were the private gardens belonging to the wealthy magnates in old times. Master of Nets Garden is the best complex wholly remaining it residential part and garden area, although it is one of the smallest one, it is also one of the finest one. All of the gardens mentioned above are in the UNESCO World Heritage List. In this one day itinerary, tourists will visit some of them: Humble Administrators Garden - the large and best one of the Suzhou style garden, Lingering Garden - the 2nd best garden in Suzhou and the Master of Nets Garden. Beyond that, tourist will also visit the Chinese Classical Garden Museum by the side of Humble Administrators Garden and enjoy a typical Suzhou cuisine lunch in the well protected old Pingjiang Street by the side of Pingjiang River inside the well protected ancient Suzhou area in central Suzhou. Humble Administrators Garden (UNESCO World Heritage), Chinese Classical Garden Museum, Master-of-Nets Garden (UNESCO World Heritage), Lingering Garden (UNESCO World Heritage), and Pingjiang Historical and Cultural Street Block. 1. In this itinerary, tourists can explore, enjoy and learn the stunning beauty of the Chinese classical gardens, to know more about Chinese arts such as garden arts, paintings, brush calligraphy, literature, philosophy and so on. 2. Stroll in the picturesque island hills, exquisite chambers, charming pavilion, graceful bridges in the well protected ancient classical gardens in Suzhou. 3. Walk on the well protected ancient Suzhou Streets to feel the authentic Suzhou style life. A Chinese garden was not meant to be seen all at once; the plan of a classical Chinese garden presented the visitor with a series of perfectly composed and framed glimpses of scenery; a view of a pond, or of a rock, or a grove of bamboo, a blossoming tree, or a view of a distant mountain peak or a pagoda. The 16th-century Chinese writer and philosopher Ji Cheng (1582 - ? ), also one of the most famous garden designers in ancient China who wrote the first garden arts monograph in the world “Yuan Ye” (means "The Craft of Gardens"), instructed garden builders to "hide the vulgar and the common as far as the eye can see, and include the excellent and the splendid."